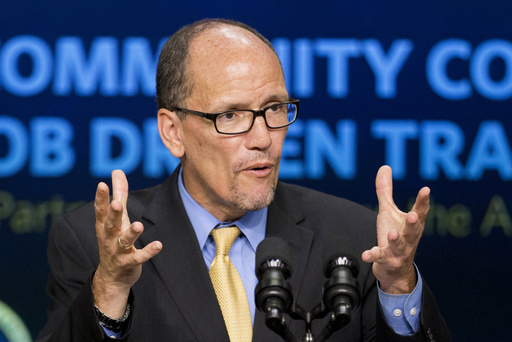 (CN) – Former Labor Secretary Tom Perez won the chairmanship of the Democratic National Committee Saturday, garnering 235 votes on the second ballot. Rep. Keith Ellison, of Minnesota, received 200 votes. Immediately after his victory, Perez’s first act was to appoint Ellison deputy chairman, a new role in the party, evidently created right on the spot. “The two of us were always united in our values, and we are united in our love for the Democratic Party,” Perez said in his acceptance speech. He went on to praise Ellison for his abilities as an organizer and repeated calls heard often during the Democrats three-day session that the party must come together. In an effort to assist in healing riffs that became open fissures during the 2016 campaign, Perez compared the disagreements within the party to the friendly differences with relatives one might have over Thanksgiving dinner. And certainly there were moments of unity Saturday afternoon. When former interim chair Donna Brazile announced Perez had won the chairmanship, the crowd erupted with chants of “Party for the people, not big money” that continued unabated for several minutes, drowning out her ongoing comments. But even amidst the constant calls for unity, disagreements over policy and the party’s future direction exposed deep ideological divisions within its membership, and left some Democrats questioning its ability to truly represent the interests of working class people. Prior to the election, the party voted Saturday to strike down a resolution that would have reinstated a seven-year ban on funding by corporate lobbyists and political action committees, and would have also prohibited corporate lobbyists from serving as at-large members. Perez’s victory was also not without controversy. Shortly before committee members were to cast their ballots Saturday afternoon, outgoing interim chair Donna Brazile announced the party would not be using an electronic voting system as planned, but instead would use paper ballots so as not to invite “interference” in the process — a nod to the hacking scandal that plagued the party last year. The move raised the hackles of Ellison supporters who said it cast doubt on the validity of the outcome. Wasserman Schultz is widely disparaged by a segment of the party still bitter over the fact — revealed in leaked emails — that she actively sought to skew the primary race between eventual presidential nominee Hillary Clinton and her Democratic challenger, Sen. Bernie Sanders of Vermont. Sanders himself chose to take the high road after the final votes were counted. Former President Barack Obama also issued a statement, congratulating Perez, and noting that his longtime friend asked immediately appointed Ellison deputy chair in a bid for party unity. “I’m proud of all the candidates who ran, and who make this great party what it is,” the former president said. “What unites our party is a belief in opportunity – the idea that however you started out, whatever you look like, or whomever you love, America is the place where you can make it if you try. It took Perez two tries to secure the chairmanship. The first ballot ended with him one vote shy of the majority he needed to win. – Developing story.